A multi-year advocacy effort to double the amount funding for Philadelphia Housing Trust Fund celebrated a hard fought win in September when Mayor Kenney and City Council agreed on a five-year $70 million commitment to the Trust Fund. Council approved $21 million from the General Fund as the first installment of the funding increase, with a promise for the remaining $49 million to come from General Fund allocations through 2022. The Philadelphia Housing Trust Fund is a dedicated and ongoing local funding source for the development of new affordable homes, the preservation and repair of existing occupied homes, and the prevention of homelessness. Established by City Council in 2005, the Trust Fund has dedicated ongoing revenue from the Deed and Mortgage Tax, generating on average $12-$13 million annually for affordable homes. The Trust Fund serves a range of income levels, with half of the funds targeted to extremely low-income families and individuals and half targeted to low- to moderate-income households earning between 30% and 115% of area median income. The Trust Fund addresses a variety of housing needs with half of its funds producing new or substantially rehabilitated homes and half supporting housing preservation, home repair, and homelessness prevention. In the Trust Fund’s twelve year history, more than eighty percent of Trust Fund revenues have supported households under 30% Area Median Income (AMI), or around $26,000 per year for a family of four. The advocacy push to double the annual funding for the Trust Fund began in response to the growing gentrification fueled displacement occurring in Philadelphia neighborhoods. Philadelphia has seen a dramatic and continued increase in the cost of housing in the wake of the Great Recession. As new development flourished and housing prices began to soar, the poverty rate among Philadelphians has remained very high at around twenty-five percent, with Black and immigrant households disproportionately among those in poverty. 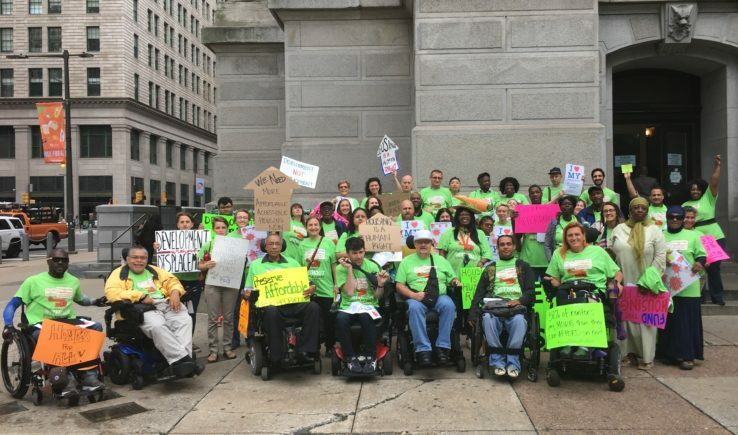 In 2015, the Philadelphia Coalition for Affordable Communities and Philadelphia Association of Community Development Corporations (PACDC) each launched initiatives that included a goal double revenue for the Trust Fund. The Coalition for Affordable Communities initiated the Development without Displacement campaign to preserve affordability in gentrifying neighborhoods and to advance public policy that encourages equitable community development for people at all income levels in their neighborhood’s future. PACDC launched their campaign Can’t Wait to Be Home: Double the Housing Trust Fund. For the next four years, the Coalition for Affordable Communities and PACDC have kept consistent pressure on the City Council to double the annual funding for the Trust Fund. Coalition members lifted up the research and policy platform with a consistent presence at city hall including a mass mobilizations on the first day of council each year, as well as at key committee and council meetings, and showing up every Thursday at the caucus room before council meetings to talk one-on-one with council members and their staff. Over the course of the campaign, the coalition used a diversity of tactics—ramping up their tactics to turn targets into allies: mobilizing, petitions, council visits, frightening ‘displacement’ pumpkins on Halloween, and a spinning ‘housing should not be a game of chance’ wheel for summer community events, and chanting and “die-in” at city hall. The Coalition also secured a commitment of neutrality from the building industry. During the four-year advocacy push, PACDC and its members testified more than thirty times before City Council, drafted and had published multiple Op-Eds in the major outlets of record, and engaged media to encourage them to write about the need for more affordable housing resources. PACDC also released research and reports as part of a public education strategy, and in 2017 launched the Affordable Homes for a Growing Philly initiative. PACDC held multiple one-on-one meetings with members of City Council and their staff to advocate directly in support of doubling the housing trust fund generally, as well as on the concrete policy proposals considered by Council during the campaign. PACDC focused its energy on building relationships with the Council President and Councilwoman Sanchez, both who became key champions. After years of Council deliberation, the organizing by the Coalition for Affordable Communities and advocacy pressure by PACDC succeeded in moving Council to act. In June 2018, by a vote of 9-8 City Council approved the 1% Construction Impact Tax that would have nearly tripled the annual revenue for the Trust Fund. Standing in the way of the adoption of the tax, however, was the almost certain reality that Philadelphia Mayor Bill Kenney would exercise his veto power when the Council reconvened from its summer recess in September. Over the course of the summer, the Coalition for Affordable Communities and PACDC turned up the heat. The Coalition aligned with a strong coalition of education activists, showing up in force at the first Council meeting in September, posting perspective eviction notices on each council person’s office to put them on notice that Philadelphia voters wanted quality homes and education for all Philadelphians. PACDC rallied its members and the public to contact the Mayor through a series of weekly actions, first on Twitter, followed by a phone call, then an email, and finally on all three mediums again. PACDC also tied the issue of affordable homes to pre-k, community schools, and local control of the school district, stated priority issues for Mayor Kenney. The culmination of the organizing and advocacy led the Mayor and Council to find an alternative to the Construction Impact Tax that would provide a significant increase the revenue for the Trust Fund: Committing $70 million in general fund while staying at the table with advocates to identify a dedicated, ongoing source. “We knew the Mayor did not want to use his first veto on funding for affordable homes for people who desperately needed that help, and if we created enough pressure, he and the other members of Council would figure out a compromise that would substantially increase revenue for the Trust Fund,” said Lichtash.